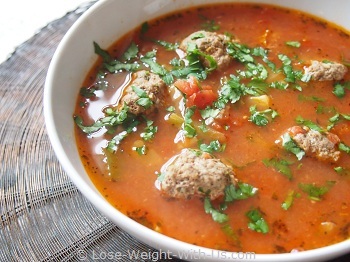 Hearty and satisfying, the all time best Italian meatball soup recipe is a perfect dish for any season. It will need about 25-30 min to prepare and cook. 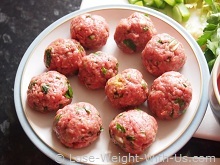 We are using extra lean mince beef with less then 5% of fat in the recipe for Italian meatballs below, but you can also make the Italian sausage meatballs using a good quality pork sausage meat. There are 248 calories and 7g of net carbs per portion. Recipe Nutritional Profile: Diabetes Appropriate, Healthy Weight, High Protein, Low Calories, Low Carbs, Low GI, Low Sodium, Gluten Free, Dairy Free. 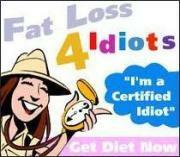 * Percent Daily Values are based on a 2,000 calorie diet. Your daily values may be higher or lower depending on your calorie needs. The information provided here is approximate and does not include: possible substitutions, optional ingredients and ingredients to taste. How did we calculate Recipe Guidelines? 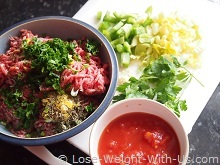 For the meatballs: combine the mince meat, egg white, mustard, garlic, dried herbs, fresh parsley, onion, chillies, salt and pepper into a bowl and mix thoroughly with clean hands. Make 10 meatballs out of this mixture. We will need a medium saucepan with a lid. For the stock: boil the kettle and use 700 mL of boiling water and 2 tsp. of instant bouillon powder to make a stock for the soup. 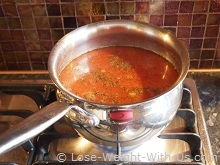 Over a high heat, pour the stock into the saucepan and add: chopped tomatoes with their juice, celery, spring onion, green pepper, garlic, basil, thyme, oregano (or you can replace dried herbs with Italian seasoning). Stir it well, then put meatballs into the soup and bring it to the boil. Once it starts boiling, reduce the heat, cover with a lid and simmer for 10-15 min. 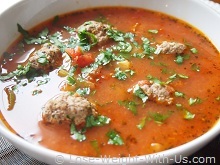 When the soup is ready, carefully transfer the meatballs from the pan into soup bowls (5 meatballs each), then pour the soup over the meatballs, garnish it fresh parsley and serve right away. Enjoy! Imagine losing in just 11 days up to 9 pounds in weight. You’ll learn how to ensure your metabolism keeps going so your body loses more fat.